The following is one of the paintings and text from my ongoing project Extinct & Almost Extinct: 50 Paintings. One of the fastest birds in the world, the Peregrine falcon can reach speeds of 200 miles an hour as it dives toward it’s flying prey, snatching it from the air. This spectacular hunting style has made it a favorite of falconers and biologists alike. Peregrines are one of the most widely ranging birds in the world inhabiting all the world’s continents but the Antarctica. The crow-sized falcon mates for life and the females are about a third larger than the males. They do not build nests but lay their eggs in depressions called scrapes often on the ledges of cliffs. There may have been as many as 4,000 nesting pairs of American peregrines until the 1940’s when the extensive use of DDT as a pesticide began in many countries. This chemical was used to eliminate insects in agriculture and also to control mosquitoes and lice that cause the spread of disease. 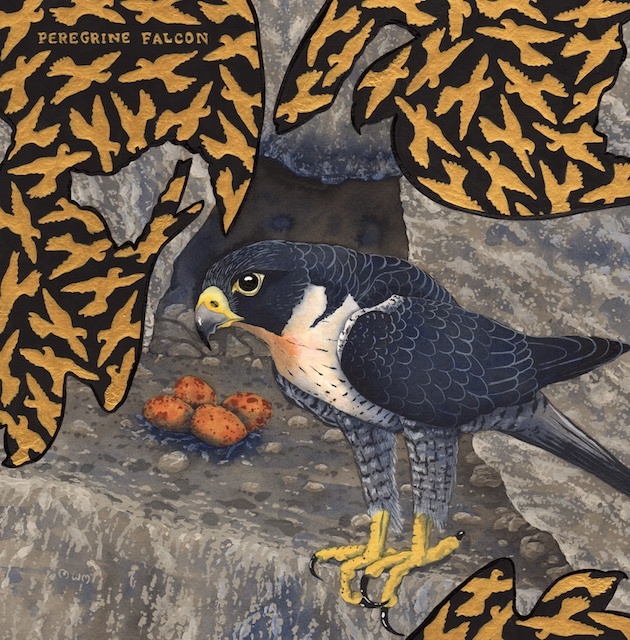 As the chemical accumulated in the birds that the falcons ate, the egg shells of the peregrine became thin and nesting failure became endemic. By 1975 the American falcon had lost 90% of its population with only 324 known nesting pairs. Concerted conservation efforts including the ban of DDT and extensive captive breeding and reintroduction efforts in the U.S., Canada and Mexico has led to the increase in population to 2,000 to 3,000 nesting pairs in North America. The bird was removed from the U.S. endangered and threatened list in 1999. In their search for prey some peregrines have moved into cities to hunt pigeons. Artificial scrapes on high buildings have been created for the birds by welcoming city dwellers who encourage the falcons to lower pigeon populations.